Welcome to the seventh in a series of blog posts in which we use the News API to look into the previous month’s news content. The News API collected and indexed over 2.5 million stories published last month, and in this blog we’re going to use its analytic capabilities to discover trends in what the media wrote about. In covering both of these topics we uncovered some interesting insights. First, apparently we’re much more interested in Donald Trump’s musings on nuclear war than the threat of nuclear war itself. Also, although the McGregor fight lived up to the hype, Conor failed to capitalize on the record-breaking press coverage to launch his ‘Notorious Whiskey’. Last month, North Korea detonated a Hydrogen bomb, which was over seven times larger than any of their previous tests. This created an increasing worry that conflict with a nuclear-armed nation is now likely. But using the News API, we can see that in the English-speaking world, even with such a threat looming, we still just can’t get enough of Donald Trump. Take a look below at the daily volume of stories with ‘North Korea’ in the title last month, which we gathered with the News API’s Time Series endpoint. The graph below shows the volume of stories with the term ‘North Korea’ in the title across every day in August. You can see that the English-speaking media were much more interested with Trump’s ‘fire and fury’ comment at the start of August than they were with North Korea actually detonating a Hydrogen bomb at the start of September. We guessed that this is largely due to publishers trying to keep up with the public’s insatiable appetite for any Donald Trump-related news. Using the News API, we can put this idea to the test, by analyzing what content about North Korea people shared the most over August. We used the Stories endpoint of the News API to look at the stories that contained ‘Korea,’ in the title that had the highest engagement rates across social networks to understand the type of content people are most likely to recommend in their social circles which gives a strong indication into readers’ opinions and interests. Take a look below at the most-shared stories across Facebook and Reddit. You can see that the popular content varies across the different networks. ‘Trump to North Korea: U.S. Ready to Respond With ‘Fire and Fury,’ The Washington Post. 118,312 shares. ‘China warns North Korea: You’re on your own if you go after the U.S.’ The Washington Post. 94,818 shares. ‘Trump threatens ‘fury’ against N Korea,’ BBC. 69,098 shares. ‘Japanese government warns North Korea missile headed toward northern Japan,’ CNBC. 119,075 upvotes. ‘North Korea shaken by strong tremors in likely nuclear test,’ CNBC. 61,088 upvotes. ‘Japan, US look to cut off North Korea’s oil supply,’ Nikkei Asian Review. 59,725 upvotes. Comparing coverage across these three social networks, you can see that Trump features heavily on the most popular content about Korea on Facebook, while the most-upvoted content on Reddit tended to be breaking news with a more neutral tone. This is similar to the patterns we observed with the News API in a previous media review blog, which showed that Reddit was much more focused on breaking stories on popular topics than Facebook. So now that we know the media focused its attention on Donald Trump, we can ask ourselves, what were all of these stories about? Were these stories talking the President down, like he always claims? Or were they positive? Using the sentiment feature of the News API’s Trends endpoint, we can dive into the stories that had both ‘Trump’ and ‘Korea’ in the title, and see what sentiment is expressed in the body of the text. From the results below, you can see that over 50% of these articles contained negative sentiment, whereas a little over 30% had a positive tone. For all of the President’s – shall we say, questionable – claims, he’s right about one thing: popular content about how he responds to issues is overwhelmingly negative. The Superfight – how big was it? We’re based in Ireland, so having Conor McGregor of all people taking part in the ‘fight of the century’ last month meant that we’ve heard about pretty much nothing else. We can use the News API to put some metrics on all of the hype, and see how the coverage compared to the coverage of other sporting events. Using the Time Series endpoint, we analyzed the impact of the fight on the volume of stories last month. Since it analyzes the content of every news story it gathers, the News API can show us how the volume of stories about every subject fluctuates over time. You can see that on the day of fight itself, the volume of stories that the News API classified as being about boxing increased, almost by a factor of 10. You can see that the McGregor-Mayweather fight totally eclipses the Joshua-Klitschko heavyweight title fight. But it’s important to give context to the data on this hype by comparing it with data from other sports. It’s becoming almost a point of reference on these News API media review blogs to compare any trending stories to stories in the World Soccer category. This is because the daily volume of soccer stories tends to be consistently the largest of all categories, so it’s a nice baseline to use to compare story volumes. As you can see below, the hype surrounding the ‘fight of the century’ even prompted more boxing stories than soccer stories, which is quite a feat. Notice how only four days after the fight, when boxing was back to its normal level and soccer stories were increasing due to European transfer deadline day looming, there were 2,876 stories about soccer compared with 191 stories about boxing. You might remember Conor McGregor launched his ‘Notorious Whiskey’ in the press conference following the fight. This was the perfect time for McGregor to launch announce a new product – right at the pinnacle of the media coverage. If you’re wondering how well he leveraged this phenomenal level of publicity for his new distilling career, we used the News API to look into that too. Take a look below at volume of stories that mentioned the new whiskey brand. It looks like mentions of ‘Notorious Whiskey’ have disappeared totally since the weekend of the fight, leaving us with this odd-looking bar chart. But we doubt that will bother Conor at the moment, considering the $100m payday! That covers our quick look into the News API’s data on two of last month’s stories. 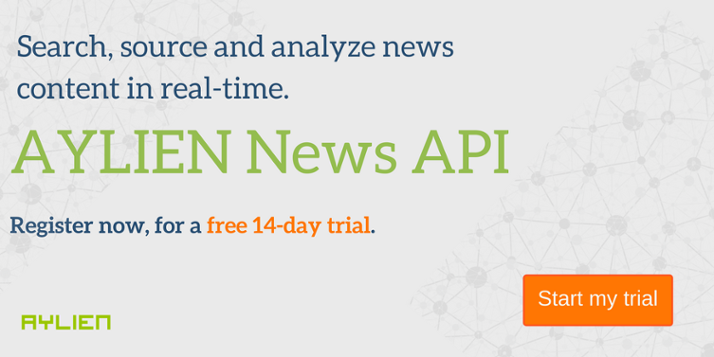 The News API gathers over 100,000 stories per day, and indexes them in near-real time. This gives you a stream of enriched news data that you can query. So try out the demo or click on the link below for a free trial to use our APIs for two weeks. Highlights of EMNLP 2017: Exciting Datasets, Return of the Clusters, and More!